What cannot go inside the dumpster? (No Concrete materials, Asphalt, Stone, Rock, Gravel, Sod or loads of Dirt). 10 yard dumpsters have a 2 ton or 4,000 lb weight limit. 12 yard dumpsters have a 3 ton or 6,000 lb weight limit. 20 yard dumpsters have a 4 ton or 8,000 lb weight limit. 30 yard dumpsters have a 4 ton or 8,000 lb weight limit. The charge for weight beyond limit specified above is: $55/ton. All materials must be inside the hook-lift container, nothing can be higher than the top of container. By law, we are required to tarp each load for transport. We cannot pick up a container that is over-full. You will be responsible for removing excess. Is the price a total price? 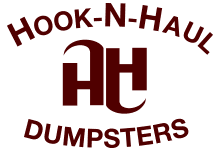 With Hook-N-Haul Dumpsters, you will never have to worry about hidden surcharges or extra fees such as delivery charges, fuel surcharges, tipping fees and environmental fees as with some other companies. Our price plus required sales tax is the total price. Possibly the same day but no later than the next day. However, we get busier toward the weekend so please call as far in advance as possible. How far do you go for delivery? We are proud to be serving North, North West and North East Austin: Including Jollyville, Cedar Park, Georgetown, Round Rock, Pflugerville, Leander, Liberty Hill, Bertram, Jarrell, Lago Vista, Jonestown, Hutto and Taylor. Our base pricing is for delivery within a general 30 mile radius of Leander. Further distances can be serviced with additional cost per mile. Call us for a price on deliveries outside general service area. Rental periods can be extended for an additional fee of $10 per day. No. Please fill out Pick Up form when container is ready for pick-up. We will pick the container within 24 hours of receiving the pick up request, not including weekends. Our hours of delivery and pick up operations are from 7:00 am until dark Monday thru Friday and closed for major holidays. Please let us know if there is neighborhood time restrictions for pick up and delivery and we will work within it. Do I need to be home when container is picked up? No, it is not necessary to be there for the container pick-up. Please make sure the container is accessible and meets the above weight and restricted material conditions. We respect your property and make every effort not to damage it. A barrier is placed between your driveway and our hook-lift dumpsters to help ensure no damage is done. However, we cannot take responsibility for any damage that occurs to the driveway or lawn regardless of weather conditions. No. We will do our best to place your container in a convenient space or wherever you request, but containers cannot be moved. Moving a container can cause damage to underside. If damage occurs, you are responsible for the cost to correct. Does Hook N Haul offer a complete demolition and disposal service? Yes! We will be happy to assist with labor or provide complete demolition and disposal service for your project. Just give us a call for a quote. Yes. We make every effort to protect the environment with safe and Eco-friendly practices, including appropriate and legal disposal of waste materials based on their nature and re-use potential. 1 What cannot go inside the dumpster? 2 Is there a weight limit? 3 How high can I fill the container? 4 Is the price a total price? 5 How quickly can I get a dumpster? 6 How far do you go for delivery? 7 How long can I keep the container? 8 Will the container be picked-up automatically? 9 Do I need to be home when container is picked up? 10 Will the dumpster damage my property? 11 Can I move the container? 12 Does Hook N Haul offer a complete demolition and disposal service? 13 Is your Disposal Operation environmentally friendly? 14 How much does trash weigh?